Ed Alexander was born and raised in Cincinnati, Ohio. His parents were Ed Alexander Sr. and Anna Klein Alexander. He played football and baseball in high school. Ed attended the University of Cincinnati on a tuition and job scholarship in both sports. One of the jobs was an iceman for two years during the summer months. Graduated in 1940 with a BS in Physical Education. Enlisted in the Naval Reserve for a one month cruise on the USS Arkansas, New York to Panama and return and, then, on to Annapolis for three months to become an Ensign. He received a medical discharge because of broken nose which occurred in his sports activities. The Draft began and Ed was classified as 4F because of the medical discharge from the Navy. He had his nose repaired and thought to rejoin the Navy with the Gene Tunney program (have picture in Cincinnati Post with him). The Navy would not negate the medical discharge. Ed started a new career with the owner of a small street and sewer company. In December, 1941 he had a date with Mary Roark, the girl he was later to marry. Ten to fifteen days later Ed was at Ft. Thomas, KY being reclassified from 4F to 1A. He told the Draft Board not to count on him because he planned to take the Aviation Cadet exam the next day. He passed the exam and was on my way to Santa Ana, CA for PreFlight school. Ed was commissioned a 2nd Lieutenant on December 17, 1942 with a 1035, Bombardier rating. Note: Ed flew 8 combat missions with the 492nd Bomb Group including the first raid on Politz and was among those reassigned to the 467th Bomb Group, 788th Squadron with whom he flew additional 18 missions with. Note: See "Mishap of Crew 92" under "Stories" to the right. The return to England took about 6 weeks with an American plane from Poltava, Ukraine picking up the crew in Lublin, Poland and returning to Poltava. As Ed had a 1034 Navigator rating there was sufficient crew to fly a B-24 from Poltava to Bari, Italy. The aircraft was checked out and ready to leave when the announcement came that President Roosevelt had died. This held up the flight two weeks. Ed made the trip to Bari and was transferred to a B-17 to fly to London and, then, to the 467th Bomb Group at Rackheath. The 467th had completed their missions by this time. The Chapman crew and Ed were sent to a rest camp, after which they returned to Rackheath and, then, to the United States. After a month at home, Ed reported to Sioux Falls, South Dakota, with expectations of being assigned to the Pacific theater. However, the war ended in the Pacific and Ed was separated from military service at Ft. McCoy, Wisconsin. 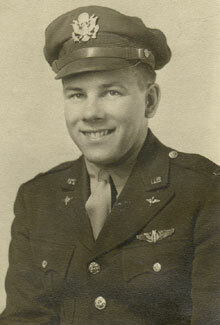 Charley Barrett, the squadron S2 Intelligence Officer in the 492nd Bomb Group, recommended Ed to the Cory Corporation, a manufacturer of coffee brewers and other appliances in Chicago. He was hired as a salesman and became Sales Manager and, then, V.P of Sales of the Restaurant and Institutional Division. Ed stayed with the Cory Corporation for 31 years. Hershey Corporation bought the company so, for the last ten years of his employment, he was part of the Hershey Corp. Ed retired in 1977. Note: See the Pravda story, "They Met in '45" in the links. This tells of the relationship developed, after twenty-one years, with the Russian Colonel Ed had met upon parachuting into Germany. On April 24, 1943 Ed married Mary Roark at Langley Field. After 59 great years of marriage, Mary passed away on January 29, 2002. Ed has a son, Bill, who retired from the Air Force after 29 years with the rank of Colonel. Bill and his family reside in the Washington, DC area.